Microsoft is constantly revising its certification path, which means that CBT Nuggets is constantly revising its course offerings. Learn more about CBT Nuggets Business Solutions. With the launch of Windows Server 2016, Microsoft introduced a variety of new skills, technologies, and advances, giving IT pros the opportunity to upgrade their knowledge, abilities, and skills as they work to learn the new product. The MCSA: Windows Server 2016 certification prepares learners for roles including network or systems administrator, computer network specialists, and more. The Microsoft Certified Solutions Associate (MCSA): Windows Server 2016 certification is designed to prove mastery of the skills required to administer Windows Server 2016, including installation and implementation of storage solutions, Hyper-V, and Windows containers; networking with DNS, DHCP, IP address management, and advanced infrastructure; and administration of Active Directory Domain Services, group policy, Nano Server, and more. Interestingly, Windows Server 2016 includes containers, which was once almost exclusively the purview of Linux/UNIX. The certification represents a new attitude of openness between Microsoft and the Linux Foundation and embodies Microsoft’s embrace of open source. The MCSA: Windows Server 2016 certification is made up of three exams, all of which are covered by CBT Nuggets training. Typically, learners pursuing this certification path should have some familiarity (1-3 years) with Windows Server and experience working in an enterprise environment. The MCSA is considered an intermediate-level certification but has no prerequisite training or certifications. CBT Nuggets offers three study plans that map to the Microsoft MCSA: Windows Server 2016 70-740, 70-741, and 70-742 courses. These downloadable Microsoft MCSA Server 2016 study plans break down the courses and supplemental learning resources to equip learners with a strategic and manageable approach to conquer their training goals. Download the Microsoft MCSA: Windows Server 2016 70-740, 70-741 and 70-742 study plans. The following exam details are applicable for each exam that makes up the Microsoft MCSA: Windows Server 2016 certification. Learn more about Microsoft exam formats and question types. Skills Measured: Each exam registration page on the Microsoft website provides a list of Skills Measured (which is a free resource) to guide your study and preparation. *Microsoft does not publish the exact number of questions associated with its exams. Therefore, the number of questions a learner will see varies. Microsoft exams have a reputation for being challenging. Many learners find they have to take an exam more than once to achieve a successful outcome. Fortunately, Microsoft is aware of the level of challenge associated with their exams, and often provides an Exam Replay, allowing learners to retake exams at a fraction of the cost. Please note that the Exam Replay may not always be available. As of this post’s publication date, each of the exams associated with the MCSA: Windows Server 2016 certification offers the option to include Exam Replay, but that may change. Learners should research Exam Replay availability to avoid missing out on the opportunity. Payscale.com provides a helpful salary guide to help learners determine appropriate pay scales for job opportunities associated with the MCSA: Windows Server 2016 certification. Depending on professional experience, Payscale.com reports a range of salaries for employees holding any MCSA certification between $42,793 and $136,630. Roles that are common for those holding an MCSA certification include systems administrator, systems engineer, network administrator, Windows system administrator, IT manager, IT director, and more. Earning MCSA certification provides learners with a strong foundation to build upon in different areas such as Server 2016 or machine learning. Common entry-level MCSA jobs include network and systems administrators. Demand for MCSA-certified professionals is strong. According to the U.S. Bureau of Statistics, this certification offers a faster than average growth field. From 2010 to 2020, the demand for MCSA-certified professionals is expected to grow nearly 30 percent. The best way to achieve success in IT is to never stop learning. The best way to learn new IT skills is CBT Nuggets. Learn more about CBT Nuggets Business Solutions. The MCSA is not subject to recertification or renewal. Microsoft’s MCSA certifications do not expire, meaning no recertification or continuing education is necessary to renew your MCSA certification. MCSA certifications are, effectively, lifetime certifications that are valid as long as the technology exists. However, it’s important to note that under Microsoft’s new certification structure, earning an expert-level certification (MCSE) can be accomplished by taking just one additional exam, of your choosing, from a pool of exam options. Learn more about Microsoft certifications from our post, What to Expect from the New Microsoft Certification Paths. The MCSA is a building block that allows learners to earn a variety of other certifications from Microsoft. After earning the MCSA: Windows Server 2016 certification, most learners choose to take the next step by earning an MCSE (Microsoft Certified Solutions Expert) certification. 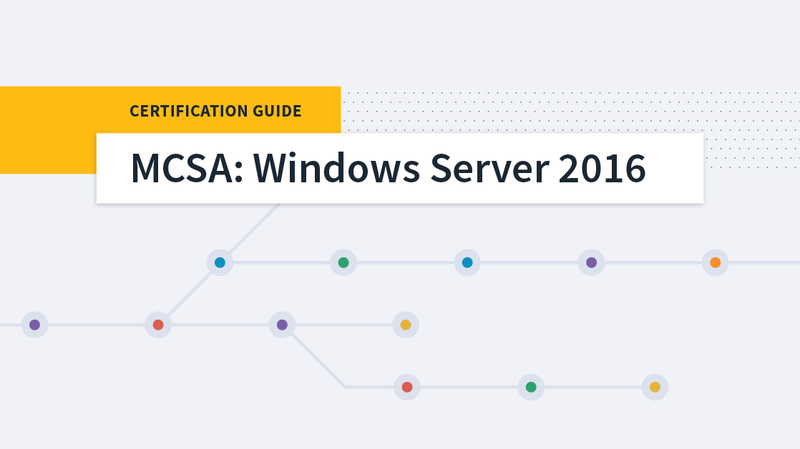 Under Microsoft’s new certification structure, the next step following the MCSA: Windows Server 2016 is to earn the MCSE: Cloud Platform and Infrastructure. The certification requires that learners pass just one additional exam from a pool of 10 exam options. CBT Nuggets offers training for seven of the 10 course options: 70-532: Developing Microsoft Azure Solutions, 70-533: Implementing Microsoft Azure Infrastructure Solutions, 70-534: Architecting Microsoft Azure Solutions, 70-413: Designing and Implementing a Server Infrastructure, 70-414: Implementing an Advanced Server Infrastructure, 70-246: Monitoring and Operating a Private Cloud, and 70-247: Configuring and Deploying a Private Cloud. *Please note that VMware now offers the VCP6.5-DCV. CBT Nuggets will develop courses to prepare learners for this certification soon! Check our in-progress courses to watch videos as they are completed by trainer Keith Barker. Microsoft certifications are laid out as a pyramid, with each level of certification leading learners to higher, more specialized, complex certifications. At the base of the Microsoft pyramid, IT professionals develop the foundation of knowledge with the MTA (Microsoft Technology Associate). The next level is the MCSA (Microsoft Certified Solutions Associate) and MCSD (Microsoft Certified Solutions Developer), which include many of the most popular certifications among IT professionals that are offered by Microsoft, including Server 2012, Office 365, and Azure. Finally, the MCSE (Microsoft Certified Solution Expert) represents the highest level of certification offered by Microsoft and provides learners the opportunity to develop specializations related to MCSA-level content. As Microsoft describes it, the new MCSE and MCSD certifications (MCSE: Cloud Platform and Infrastructure, MCSE: Mobility, MCSE: Data Management and Analytics, MCSE: Productivity, and MCSD: AppBuilder) are aligned to Centers of Excellence, used by the Microsoft Partner Network to identify technical competencies that are widely recognizable by both Microsoft partners and customers. These credentials do not have a recertification requirement. Instead, the achievement date signifies how you keep up with changes to the technology. With the launch of Windows Server 2016, Microsoft has stopped supporting Server 2008, making this the perfect opportunity to upgrade and expand your Windows Server skills and knowledge, particularly as we enter a new era of Microsoft openness with containerization, Linux, and Nano Server, just to mention a few of the exciting new elements. Take advantage of this chance to expand your skills and your career opportunities with Server 2016! Watch. Learn. Conquer the MCSA: Windows Server 2016! When is the 70-740 content coming? As Steven asked, I myself am curious for when 70-740 will be out? I’m with everyone else. When can we expect the 70-740 nuggets? Is it recommended to take the 70-740, 741, and 742 in that order? I’ve been told taking the 742 first would make it easier to understand the material for the other two exams.